Ro Boddie and Marni Penning in Mosaic Theater Company's The Agitators. Ro Boddie (far right) and the cast in Studio Theatre's Three Sisters. 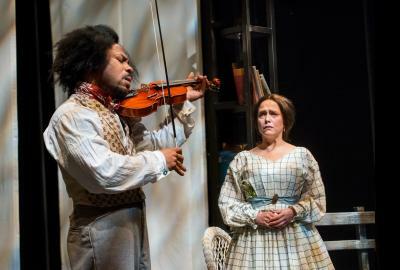 With D.C. theatre credits including Angels in America, Master Harold … and the Boys, and Three Sisters, actor RO BODDIE isn’t shy about taking on a prodigious part — which is a good thing, considering he’s currently playing Frederick Douglass in Mosaic Theater Company’s production of The Agitators. He joins us for a few words on the August Wilson premiere he’d most like to travel back in time to see, the quick-change he’d most like to take a do-over on, and why he’d be down for a date with Marvin Gaye. It’s all in this week’s Take Ten from theatreWashington. The first play I ever saw was a touring show of Beauty and the Beast when I was in middle school. The only thing I remember is the moment that Belle fell in love with the Beast, and the actor who played the beast spun around in a circle rapidly with strobe lights flashing. Suddenly, the actor transformed from a Beast to a dashing prince before my eyes. I saw magic in the theatre that afternoon. My first involvement in a play was my junior year in high school, when I was cast as Tito Merelli in Lend Me A Tenor by Ken Ludwig. I was cast as an Italian opera singer for the first, and probably the last time in my life. It was a joy to be introduced to theatre with such a hilarious comedy. My favorite play is Seven Guitars by August Wilson. The story revolves around a musician with a talent and big dreams, living in a world that throws every hurdle in his path towards fulfilling that dream. Of course, he decides to make his own fate by any means, and it doesn‘t end well for him. Well my day job is my night job. I‘m a bartender in Brooklyn, NY. It‘s not the worst, except when I have to close the bar at 4am and the next morning I have to be at an audition. That‘s when it can be...a lot. In a show here in DC, I had a quick change before the last scene of the play and had to pee SO BAD. So after the quick change, I sprinted to the bathroom down two flights of stairs and made it back in time for my entrance. It wasn‘t until curtain call when I bowed, and realized my fly was down during that entire scene. 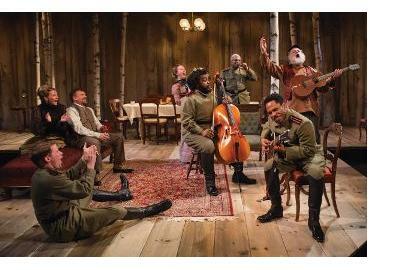 6) What are you enjoying most about working on The Agitators at Mosaic Theater Company? I‘m enjoying the fact that every night I get to share the stage with this amazing cast. Marni Penning Coleman who plays Susan B. Anthony, is an incredible scene partner! We get to embrace these titans who were passionate and relentless. The never took NO for an answer. My hope is that the audience will be inspired to go out into the world to make positive change, never stopping no matter how many NO‘s they get. My dream date will probably be with Marvin Gaye, haha. The man exuded sexiness and charisma effortlessly, but also wasn‘t afraid to make music reflecting the hardships so many African- Americans faced in the 60‘s and 70‘s. I‘m blessed to do my dream job every night at Mosaic Theater Company. Being an actor on stage doing work that can change a community. Unfortunately, being a actor on stage is not as consistent as I‘d like. So I guess the dream is to have a consistent dream job. If I could travel back in time, I‘d love to see James Earl Jones in the original production of Fences on Broadway. 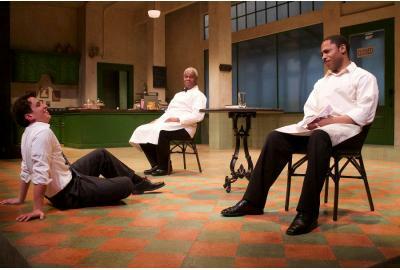 To see a master on stage bringing August Wilson‘s words to life. I would tell the MFA student to hold on to the imagination of a 8 year old, take from your training that which works for you, and know that the theatre is about collaboration. Meaning try to leave you ego at the door. 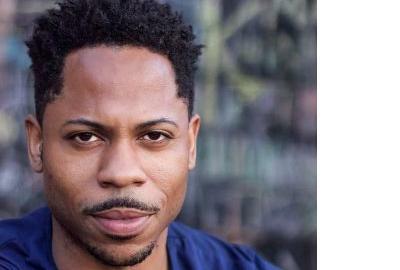 RO BODDIE is thrilled to be playing Frederick Douglass in The Agitators by Mat Smart. Ro lives in Brooklyn, NY but has done a number of shows in the D.C. area including: Master Harold and the Boys at Round House Theatre; Three Sisters and No Sisters and DIRT at Studio Theatre; Seven Guitars at No Rules Theatre, for which he received a 2015 Helen Hayes Award nomination, The Robert Prosky Award for Outstanding Lead Actor in a Play; and Angels in America at Forum Theatre.